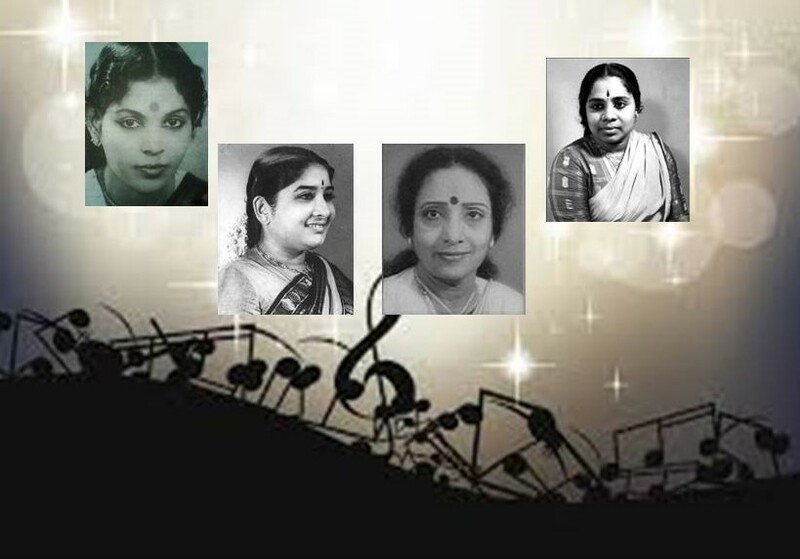 It is a well known fact that P Sushila and TM Soundararajan were the king and queen of Tamizh film music for nearly 3 decades. Sushila with her sweet and mellifluous voice almost crooned for all the heroines from Anjali Devi to some recent time heroines. Her list of songs must be a gargantuan. Her popularity was amazing until Ilayaraja came and promoted S Janaki in a big way. Janaki’s success was not only her unique vocal power but also Ilayaraja’s backing with the extraordinary melodic tunes. I cannot but think at this juncture some of the voices which appeared, stayed for some time and disappeared unceremoniously. This thought came to my mind after writing the earlier posting. Because in ‘Athikkai’ song, the other nasal voice was Jamuna Rani who was known for her some peculiar songs; the last may be ‘Naan Sirithal Deepavali’ in ‘Nayagan’ (1987) after a gap of 16 long years. Indeed, Jamuna Rani ‘s list of popular songs of yore includes ‘Tara tara vandara’, ‘Kalai vayasu’ in ‘Deiva Piravi’ (1960), ‘Paatondru ketten’ in Pasamalar (1961), ‘Alek’ in ‘Panama Pasama’ (1968) and ‘Punnagai mannan’, a duet with Sushila in ‘Iru Kodugal’ (1969). Jikki whose name is PG Krishnaveni, wife of music director and playback singer AM Raja was noticed for her voice as well as a style of pronunciation with a slight stress. She was part of the popular rock n roll song ‘Yaradi nee mohini’ in Uthamaputhiran with Jamuna Rani (1958). She is remembered for her songs in movies like ‘Amara Deepam’ (‘Pachchai kili paduthu’ and ‘Jalilo jimkana’-1956), ‘Manthiri Kumar’i, the famous ‘Varai nee varai’(1950), ‘Kalyanaparisu’ (‘Thullatha manamum’,1959), ‘Then Nilavu’ (‘Urengum thedi’, 1961) and two haunting melodies of Ilayaraja (‘Ninathathu yaro’ from ‘Pattukkoru Thalaivan,1989 and ‘Naan unnai nenachchen’ from ‘Kannil Theriyum Kathaigal’, 1980) which she sang after a lapse of several years of her husband Raja’s accidental death. MS Rajeswari made her debut through AVM Studios movies as a resident playback singer. She lately (under) graduated to sing for children through cooing and babbling starting with the all time famous ‘Ammavum neeye’ (1960-‘Kalathur Kannamma’). It was further exploited to sing ‘Kozhi oru koottile’ (1965 ‘Kuzhanthayum Deivamum’), ‘Sundelukkum sundelikkum’ (1960-‘Kaithi Kannayiram’) to name a few. In fact, Rajeswari with her syrupy voice sang sweet songs in ‘Parasakthi’ (1952-‘O raskikkum seemane’ and ‘Pudupennin manasai’), ‘Oar Iravu’ (1951-‘Thunbam nergayil’) ‘Enni enni parkamanam’ (1949) in ‘Vazhkai’’ in ‘Penn’ (1954-‘Sonna sollai marandilamo’ etc. ), in Kumudam (‘Miyaw miyaw’ -1961), ‘Sengamala Theevu ‘ (‘Pesiyathu nanillai – 1962) with normal tenor. Her last notable song was, perhaps, ‘Naan sirithal’ in ‘Nayagan’ (1987) with Jamuna Rani. P Leela, a classical singer by training who later completely devoted herself to concerts. Initially, she had her share in film songs; popular ones are ‘Ellam inbamayam’ (1951) in ‘Manamagal’ ‘Vaarayo vennilave’ in ‘Missiamma’ (1955), ‘Neethaana ennai’ in Maya Bazaar’ (1957), ‘Raja magal’ and ‘Kannum Kannum kalanthu’ in ‘Vanjikottai Valiban’ (1958) ‘Kathiruppan kamalakkannan’ in ‘Uthama Puthiran’ (1958) and in ‘Lava Kusa’ (1983). However, her forte was devotional songs and her popularity was significant there. These singers were in a way ‘unsung’ singers though contributed hundreds of songs in movies. Blame it on the insipid songs they were offered or the luck which eluded them to get the best. Life itself is a chance of luck in my view, notwithstanding the animated discourses of the positive preachers; but, in the world of ‘Art’ one needs it in higher proportion! That is a fact.